Ever since my sister Lynette’s wedding two years ago a strange thing has been happening. I took many wonderful pictures to capture the beauty of the day. I uploaded the pictures to my computer and began enjoying the pictures as ususal. The days passed…I took more pictures…I placed the memory card in the computer and waited in anticpation for my new picutres to upload. Imagine my surprise when a mystery picture appeared. 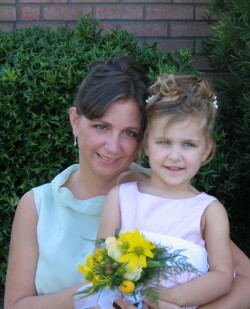 The “mystery” picture is my sister Judy and her daughter, Anna at my sister, Lynette’s wedding. I put the memory card back in the camera and searched for the leftover wedding picture…nothing…nada…It is never visible on our Cannon PowerShot S1 IS camera…Ithink it’s gone…but no. For over two years now the mystery picture returns each time I upload a new batch of pictures. Is there a strange thing going on with our camera? Does anyone else get taunted by a mystery picture on their memory card? Hmmm…..
~ by legmaker on December 14, 2007.